Conductor: As Confucius probably never said: " It is better late than never!" As Confucius probably never said: " It is better late than never!" Now that is unusual for me, the person who tries to live in the slow lane, rushing. I am actually rushing against a big rise in postal costs to Europe that takes effect at midnight. I am more relaxed about the rest of the world the postage costs to other countries will be cheaper. 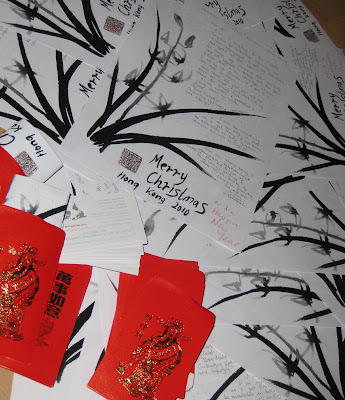 I sent a lot of Christmas mail from Hong Kong while the remaining fifty letters to friends have been sitting on the floor waiting to be packed up Chinese-style to be sent as New Year greetings. After a very congenial midday-wait in the local post office queue, in an atmosphere that can only be described as loud and festive although no champagne corks were popping, I was informed of the changes in postal charges. I was, in fact. prevented from posting one of my own books to the USA for six Euros and was told to put it in the post-box tomorrow for three Euros and forty-five cents! I will check it out again before I actually do it, but my local post office is usually very efficient so I really do not have any reason to question it. It is just that things like this do not usually happen. Above are just a couple of pictures of the early-afternoon-mess on the floor of my livingroom, now cleared away as I write the addresses and stick on the stamps and airmail stickers, the thing that for me still makes a letter look so exciting. I am using stamps that I bought months ago in the hope of being prepared this year for Christmas letter posting. I do not what to buy a roll of five cent stamps to make the price right! I will try harder next year to post pre-Christmas greetings and not pre-New Year wishes, and I am still as determined as ever not to resort to cyberspace mail only, although I have received some very lovely and very welcome cards over cyberspace. I love to have cards to hang up in my flat between and abover the curtains, a-la Mr Bean, my relatives and friends tell me that they wait in anticipation what creation is on offer this year. 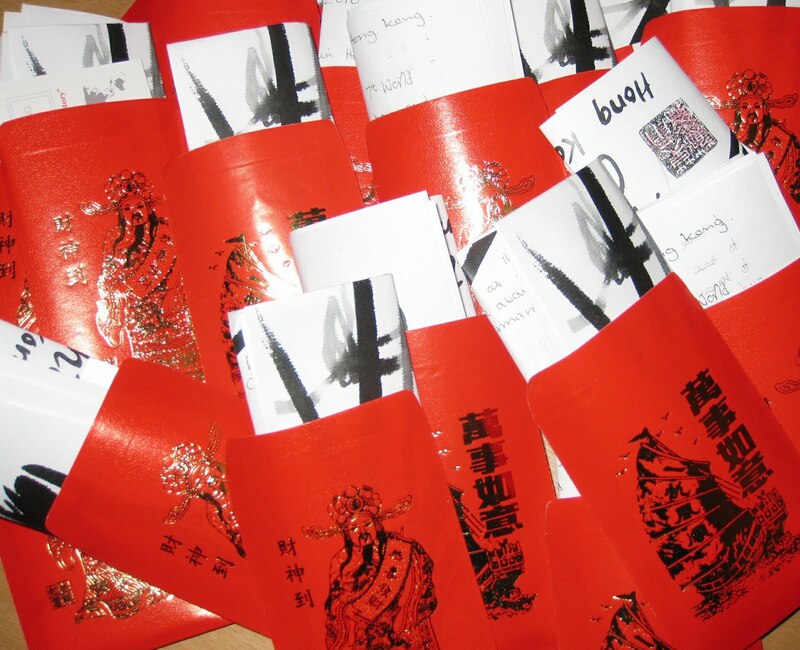 As you see this year is Chinese. I wonder what the flavour will be next year! Thanks to all for email and snail mail greetings, all very much appreciated.